Tia Pope loves being a Cisco IT Engineering Intern, not only for the opportunity it gives her, but for the opportunity she has to share her story with young girls just like her to help excite them about technical fields. And boy, does she have a story!Tia was raised in a single-parent family with seven siblings where they moved around a lot and were even homeless for a time. Often, her education was secondary to ensuring her younger siblings were taken care of after school which left her with very limited time to complete her own homework. There were very few encouraging figures in Tia’s life as a child and frequently she was left to learn by trial and error, yet she was determined not to let her circumstances define her and continued to persevere. Tia excelled in IB and AP level programs that were, unbeknownst to her, putting her on the right track for a higher education. After graduation she thought she would simply join her siblings working on an assembly line – that’s where she was wrong. A high school guidance counselor called her into his office one day and showed her a list of colleges that wanted to give her scholarships and enable her to continue her education due to her incredible GPA and time on the track team. Prior to this moment, Tia wasn’t even aware of colleges beyond the technical school in her local community. “I knew I wasn’t any of those things that others said I was – I wasn’t stupid, or lazy, or irresponsible. So even though they discouraged me with those words, I didn’t want to believe them. I had a dream and I knew not to ever give up on that dream,” Tia asserted. Tia was living in a laundry room at the time she decided to attend the University of South Carolina for Civil Engineering, and took that acceptance letter to refuel her passion and ignite the direction of her future. She was going to do something with her life! Even in college, as the seemingly lone-female in predominantly male courses, Tia was given grief with a professor who even proclaimed that he “didn’t have to teach her” as she was already behind her classmates. Again, Tia accepted the challenge and walked away with the second highest grade in the class. On the verge of dropping out due to lack of support and guidance, however, Tia was then encouraged by her Dean to change her major to IT after she had helped to fix his computer one day, not even realizing who he was. She took his advice and later, upon graduation, received 27 job offers in the midst of a tech boom. Tia took the role that perhaps was not the shiniest, however it was where she knew she would learn and grow the most within the industry. She became a Process Control Engineer and though she had no academic or professional background in this position, she was promoted four times in two years and became a Lead Engineer and managed multi-billion dollar, continuous improvement projects. This lead to even more doors opening for Tia as she wanted to expand her knowledge even further. 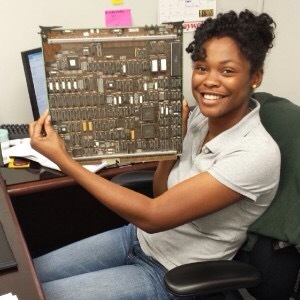 She applied for grad school at Georgia Tech and is now working on her masters in computer science, which landed her an internship with Cisco. Tia also loves that she’s been able to go to several schools and talk to young children about Cisco and what we do here. It’s brought back memories of where she has been, and continued her passion into where she is going. She says many of the children aren’t quite sure about the tech industry but when they finally learn a little more about it and can understand how they can make an impact it truly opens their eyes. Tia loves teaching the community about tech, but also how to gain further knowledge and opportunities in connecting and applying that knowledge. She began a Google community called Nerdy Bones just for this very reason. What started as a way for women in tech to connect has now become a group with over 100 members that was recently designated as an official Georgia Tech campus organization that inspires both men and women to chase their dreams in the tech industry.